Vostok 1 (Russian: Восто́к, East or Orient 1) was the first spaceflight of the Vostok programme and the first manned spaceflight in history. The Vostok 3KA space capsule was launched from Baikonur Cosmodrome on 12 April 1961, with Soviet cosmonaut Yuri Gagarin aboard, making him the first human to cross into outer space. The orbital spaceflight consisted of a single orbit around Earth which skimmed the upper atmosphere at 169 kilometers (91 nautical miles) at its lowest point. The flight took 108 minutes from launch to landing. Gagarin parachuted to the ground separately from his capsule after ejecting at 7 km (23,000 ft) altitude. The final decision of who would fly the mission relied heavily on the opinion of the head of cosmonaut training, Nikolai Kamanin. In a 5 April diary entry, Kamanin wrote that he was still undecided between Gagarin and Titov. "The only thing that keeps me from picking [Titov] is the need to have the stronger person for the one day flight." Kamanin was referring to the second mission, Vostok 2, compared to the relatively short single-orbit mission of Vostok 1. When Gagarin and Titov were informed of the decision during a meeting on 9 April Gagarin was very happy, and Titov was disappointed. On 10 April, this meeting was reenacted in front of television cameras, so there would be official footage of the event. This included an acceptance speech by Gagarin. As an indication of the level of secrecy involved, one of the other cosmonaut candidates, Alexei Leonov, later recalled that he did not know who was chosen for the mission until after the spaceflight had begun. Gagarin was examined by a team of doctors prior to his flight. One doctor gave her recollection of the events in an interview with Russia Today in April 2011: "Gagarin looked more pale than usual. He was unsociable and quiet, which was not like him at all. He would answer by nodding or a short 'yes' to all questions. Sometimes he would start humming some tunes. This was a different Gagarin. We geared him up, and hugged. And I said, 'Yuri, everything will be fine.' And he nodded back." The letters "CCCP" were hand-painted onto Gagarin's helmet by engineer Gherman Lebedev during transfer to the launch site. As it had been less than a year since U2 pilot Gary Powers was shot down, Lebedev reasoned that without some country identification, there was a small chance the cosmonaut might be mistaken for a spy on landing. The entire mission would be controlled by either automatic systems or by ground control. This was because medical staff and spacecraft engineers were unsure how a human might react to weightlessness, and therefore it was decided to lock the pilot's manual controls. In an unusual move, a code to unlock the controls was placed in an onboard envelope, for Gagarin's use in case of emergency. :278 Prior to the flight, Kamanin and others told Gagarin the code "1-2-5" anyway. Electrocardiogram of Gagarin recorded 11 April 1961, at 19 hours and 35 minutes. Exhibited at the Memorial Museum of Cosmonautics in Moscow. 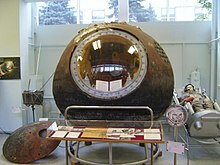 At Baikonur Cosmodrome on the morning of 11 April 1961, the Vostok-K rocket, together with the attached Vostok 3KA space capsule, were transported several kilometers to the launch pad, in a horizontal position. Once they arrived at the launch pad, a quick examination of the booster was conducted by technicians to make sure everything was in order. When no visible problems were found, the booster was erected on LC-1. At 10:00 (Moscow Time), Gagarin and Titov were given a final review of the flight plan. They were informed that launch was scheduled to occur the following day, at 09:07 Moscow Time. This time was chosen so that when the capsule started to fly over Africa, which was when the retrorockets would need to fire for reentry, the solar illumination would be ideal for the orientation system's sensors. At 18:00, once various physiological readings had been taken, the doctors instructed the cosmonauts not to discuss the upcoming missions. That evening Gagarin and Titov relaxed by listening to music, playing pool, and chatting about their childhoods. At 21:50, both men were offered sleeping pills, to ensure a good night's sleep, but they both declined. Physicians had attached sensors to the cosmonauts, to monitor their condition throughout the night, and they believed that both had slept well. Gagarin's biographers Doran and Bizony say that neither Gagarin nor Titov slept that night. Chief Designer Sergei Korolev didn't sleep that night, due to anxiety caused by the imminent spaceflight. At 05:30 Moscow time, on the morning of 12 April 1961, both Gagarin and his backup Titov were woken. They were given breakfast, assisted into their spacesuits, and then were transported to the launch pad. Gagarin entered the Vostok 1 spacecraft, and at 07:10 local time (04:10 UTC), the radio communication system was turned on. Once Gagarin was in the spacecraft, his picture appeared on television screens in the launch control room from an onboard camera. Launch would not occur for another two hours, and during the time Gagarin chatted with the mission's main CapCom, as well as Chief Designer Sergei Korolev, Nikolai Kamanin, and a few others. Following a series of tests and checks, about forty minutes after Gagarin entered the spacecraft, its hatch was closed. Gagarin, however, reported that the hatch was not sealed properly, and technicians spent nearly an hour removing all the screws and sealing the hatch again. According to a 2014 obituary, Vostok's chief designer, Oleg Ivanovsky, personally helped rebolt the hatch. There is some disagreement over whether the hatch was in fact not sealed correctly, as a more recent account stated the indication was false. During this time Gagarin requested some music to be played over the radio. Korolev was reportedly suffering from chest pains and worried, as up to this point the Soviet space launch rate was 50% (12 out of 24 launches had failed). Two Vostoks had failed to reach orbit due to launch vehicle malfunctions and another two malfunctioned in orbit. Korolev was given a pill to calm him down. Gagarin, on the other hand, was described as calm; about half an hour before launch his pulse was recorded at 64 beats per minute. 06:07 UT Launch occurred from the Baikonur Cosmodrome Site No.1. Korolev radioed, "Preliminary stage..... intermediate..... main..... lift off! We wish you a good flight. Everything is all right." Gagarin replied, "Let's roll! (Poyekhali!)." Gagarin's parachute opened almost right away, and about ten minutes later, at 08:05 UT, Gagarin landed. Both he and the spacecraft landed via parachute 26 km (16 mi) south west of Engels, in the Saratov region at 51°16′14″N 45°59′50″E﻿ / ﻿51.270682°N 45.99727°E﻿ / 51.270682; 45.99727. It was 280 km to the west of the planned landing site (near Baikonur). (b) it precludes any foreign government declaring that the cosmonaut is a military scout. The flight was celebrated as a great triumph of Soviet science and technology, demonstrating the superiority of the socialist system over capitalism. Moscow and other cities in the USSR held mass demonstrations, the scale of which was comparable to World War II Victory Parades. Gagarin was awarded the title of Hero of the Soviet Union, the nation's highest honour. He also became an international celebrity, receiving numerous honours and awards. 12 April was declared Cosmonautics Day in the USSR, and is celebrated today in Russia as one of the official "Commemorative Dates of Russia." In 2011, it was declared the International Day of Human Space Flight by the United Nations. Gagarin's informal reply Poyekhali! ("Let's roll!") became a historical phrase used to refer to the arrival of the Space Age in human history. Later it was included in the refrain of a Soviet patriotic song written by Alexandra Pakhmutova and Nikolai Dobronravov (He said "Let's roll!" He waved his hand). Officially, the U.S. congratulated the Soviet Union on its accomplishments. Writing for The New York Times shortly after the flight, however, journalist Arthur Krock described mixed feelings in the United States due to fears of the spaceflight's potential military implications for the Cold War, and the Detroit Free Press wrote that "the people of Washington, London, Paris and all points between might have been dancing in the streets" if it were not for "doubts and suspicions" about Soviet intentions. Other US writers reported worries that the spaceflight had won a propaganda victory on behalf of communism. President John F. Kennedy was quoted as saying that it would be "some time" before the US could match the Soviet launch vehicle technology, and that "the news will be worse before it's better." Kennedy also sent congratulations to the Soviet Union for their "outstanding technical achievement." Opinion pages of many US newspapers urged renewed efforts to overtake the Soviet scientific accomplishments. When Soviet officials filled out the FAI papers to register the flight of Vostok 1, they stated that the launch site was Baykonur at 47°22′00″N 65°29′00″E﻿ / ﻿47.36667°N 65.48333°E﻿ / 47.36667; 65.48333. In reality, the launch site was near Tyuratam at 45°55′12.72″N 63°20′32.32″E﻿ / ﻿45.9202000°N 63.3423111°E﻿ / 45.9202000; 63.3423111, 250 km (160 mi) to the south west of "Baykonur". They did this to try to keep the location of the Space Center a secret. :284 In 1995, Russian and Kazakh officials renamed Tyuratam Baikonur. As of September 2018[update], the Vostok 1 re-entry capsule belongs to the S. P. Korolev RSC Energia Museum in Korolev City. However, during the summer of 2018 it is on a temporary loan to the Space Pavilion at the VDNKh in Moscow. Vostok was the lead ship of Fabian Gottlieb von Bellingshausen, who discovered Antarctica during the Russian expedition to the south polar region in 1819-1820. Some sources connect the name Vostok 1 to Bellingshausen's ship. ^ a b c "Aviation and Space World Records". Fédération Aéronautique Internationale (FAI). Archived from the original on July 26, 2009. Retrieved March 12, 2009. ^ a b c "Vostok 1 – NSSDC ID: 1961-012A". NASA. ^ "Google Maps – Vostok 1 Launch Pad – Gagarin's Start photo". Retrieved December 25, 2010. ^ "Google Maps – Vostok 1 Landing Site – Monument". Retrieved December 25, 2010. ^ "Google Maps – Vostok 1 Landing Site – Monument Photo". Retrieved December 25, 2010. ^ a b c d e f g Siddiqi, Asif A. Challenge To Apollo: The Soviet Union and the Space Race, 1945–1974. NASA. ^ Burgess and Hall, p.141. The press said that Titov was so happy for Gagarin that he almost kissed him, but Titov denies this – Burgess and Hall, p.145. ^ "Celebrating a star: 50 years since Gagarin's spaceflight". RT International. Retrieved December 22, 2015. ^ "(russian) "Where did the writing CCCP come from?" with authentic photos". Archived from the original on January 15, 2017. Retrieved October 12, 2017. ^ "Oleg Ivanovsky - obituary". The Daily Telegraph. September 21, 2014. Retrieved September 25, 2014. ^ Burgess and Hall, p.151. During a post-flight press conference on 15 April Alexander Nesmeyanov claimed that Gagarin took a sleeping pill. Also, Siddiqi, p.273, claims that they were both asleep at 21:30 when Korolev came to visit them, but Burgess and Hall, p.151, says Korolev spoke with them at this time. ^ Siddiqi, p.273; In a post-flight press conference, Gagarin also stated that he slept well. ^ Burgess and Hall, p.153. ^ Siddiqi, p.276; neither Siddiqi, nor Hall and Shayler claim that music was actually played after this request. ^ Khurana, Sukant (May 4, 2018). "VOSTOK 1 : FIRST MANNED SPACEFLIGHT IN HISTORY". Sukant Khurana. Retrieved August 2, 2018. ^ Siddiqi describes it as a "tranquilizer pill", while Hall and Shayler describe it as a "cardiac pill". ^ "1961: Soviets win space race". BBC News. April 12, 1961. ^ a b Руденко М. И. (May – June 2008). "Тогда Юра вернулся на землю не из космоса, а с того света!." интернет-газета "Русская Берёза". Retrieved March 31, 2011. ^ Harford, James (April 8, 1997). Korolev: How One Man Masterminded the Soviet Drive to Beat America to the Moon: How One Man Masterminded the Soviet Drive to Beat the Americans to the Moon. John Wiley & Sons. p. 169. ISBN 0-471-32721-2. ^ Государственная Дума. Федеральный закон №32-ФЗ от 13 марта 1995 г. «О днях воинской славы и памятных датах России», в ред. Федерального закона №59-ФЗ от 10 апреля 2009 г «О внесении изменения в статью 1.1 федерального закона "О днях воинской славы и памятных датах России"». Вступил в силу со дня официального опубликования. Опубликован: "Российская Газета", №52, 15 марта 1995 г. (State Duma. Federal Law #32-FZ of 13 March 1995 On the Days of Military Glory and the Commemorative Dates in Russia, as amended by the Federal Law #59-FZ of 10 April 2009 On Amending Article 1.1 of the Federal Law "On the Days of Military Glory and the Commemorative Dates in Russia". Effective as of the day of the official publication.). ^ 1961 Year in Review. UPI Audio Network. U.S. in Space. ^ Arthur Krock, "In The Nation; Concentration of Science on Outer Space," The New York Times p. 28, 14 April 1961. "But because of the distrust that now exists among the great nations, and has plunged them into huge programs of deadly rearmament, an achievement by one which carries a clear and direct potential of military supremacy engenders fear of its use.... And so it has become as impossible for either of the groups divided by the Cold War to welcome unreservedly such feats as Major Gagarin's in the opposite camp." ^ a b c d e f g h i j "Opinion of the Week: At Home and Abroad," The New York Times p. E11 (16 April 1961). Quotes of reactions from many US and international sources. ^ a b c d "Man in Space", The New York Times p. E1 (16 April 1961). ^ Harry Schwartz, "Moscow: Flight is taken as another sign that communism is the conquering wave," The New York Times p. E3 (April 16, 1961). ^ "The Cruise of the Vostok". Time. April 21, 1961. Retrieved November 5, 2011. ^ "Google Maps – Vostok 1 Landing Site – Monument Park Location – Satellite photo". Retrieved December 26, 2010. ^ "Google Maps – Vostok 1 Landing Site – Rocket Monument photo". Retrieved December 26, 2010. ^ "Google Maps – Vostok 1 Landing Site – Yuri Gagarin Statue photo". Retrieved December 26, 2010. ^ Amos, Jonathan (March 23, 2011). "Movie recreates Gagarin's spaceflight". BBC News. Retrieved March 27, 2011.